This article is about the men's team. For the women's team, see Japan women's national football team. The Japan national football team (サッカー日本代表, Sakkā Nippon Daihyō) represents Japan in association football and is operated by the Japan Football Association (JFA), the governing body for football in Japan. The current head coach is former footballer and current coach of the Japan national under-23 football team: Hajime Moriyasu. Japan is one of the most successful teams in Asia, having qualified for the last six consecutive FIFA World Cups with second round advancements in 2002, 2010, and 2018, and having won the AFC Asian Cup a record four times, in 1992, 2000, 2004 and 2011. The team has also finished second in the 2001 FIFA Confederations Cup and the 2019 AFC Asian Cup. Their principal continental rivals are South Korea and most recently, Australia. Japan is the only team from outside the Americas to participate in the Copa América, having been invited in 1999 and 2011. Although they initially accepted the invitation for the 2011 tournament, the JFA later withdrew following the 2011 Tōhoku earthquake and tsunami. Japan's earliest international matches were at the 1917 Far Eastern Championship Games in Tokyo, where it was represented by a team from the Tokyo Higher Normal School. Although Japan made strong showings in swimming, baseball, and track and field, its football team suffered resounding defeats to the Republic of China and the Philippines. Nevertheless, the game was promoted in Japanese schools in the 1920s. The Japan Football Association was formed in 1921, and Japan joined FIFA in May 1929. Japan's first "true" national team (as opposed to a university team chosen to represent the country) was fielded at the 1930 Far Eastern Championship Games, and drew with China for the championship title. Shigeyoshi Suzuki coached the national team to its first Olympic appearance at the 1936 Summer Olympics in Berlin. Japan was an entrant for the 1938 FIFA World Cup qualification, but withdrew before its scheduled qualifying match against the Dutch East Indies. After World War II began in earnest, Japan did not play in international competition, except for a handful of matches against Manchuria and other colonies. Its last prewar match for purposes of Elo ratings was a friendly against the Philippines in June 1940. While Korea was under Japanese rule, several Koreans played in international competition for Japan, including Kim Yong-sik (1936–40), Kim Sung-gan (1940) and Lee Yoo-hyung (1940). Japan's postwar debut was in the 1951 Asian Games in India. Japan re-joined FIFA in 1950 and played in qualifiers for the 1954 FIFA World Cup, but lost the AFC qualifying berth to South Korea after two matches, beginning an intense rivalry. Japan also joined the Asian Football Confederation in 1954. Dettmar Cramer joined the Japan national team as coach in 1960, and helped lead the team to the round of eight at the 1964 Summer Olympics in Tokyo. Japan's first major achievement in international football came in the 1968 Summer Olympics in Mexico City, where the team won the bronze medal. Although this result earned the sport increased recognition in Japan, the absence of a professional domestic league hindered its growth and Japan would not qualify for the FIFA World Cup until 30 years later. Japan made its first appearance in the Asian Cup in 1988, where they were eliminated in the group stage following a draw with Iran and losses to South Korea, the United Arab Emirates and Qatar. The late 1980s saw concrete moves to professionalize the sport in Japan. JFA introduced a Special Licensed Player system in 1986, allowing a limited number of professional players to compete in the domestic semi-professional league. Action committees were held in 1988 and 1989 to discuss the introduction of a full professional league in Japan. In 1991, the owners of the semi-professional Japan Soccer League agreed to disband the league and re-form as the professional J.League, partly to raise the sport's profile and to strengthen the national team program. The following year Japan hosted and won the Asian Cup in their second appearance, defeating Saudi Arabia 1–0 in the final. The J.League was officially launched in 1993, causing interest in football and the national team to grow. However, in its first attempt to qualify with professional players, Japan narrowly missed a ticket to the 1994 World Cup after drawing with Iraq in the final match of the qualification round, remembered by fans as the "Agony of Doha". Japan's next tournament was a defence of their continental title at the 1996 Asian Cup. The team won all their games in the group stage but were eliminated in the quarter-finals after a 2–0 loss to Kuwait. The nation's first ever World Cup appearance was in 1998, where Japan lost all their games. The first two fixtures went 1–0 in favour of Argentina and Croatia, despite playing well in both matches. Their campaign ended with a 2–1 defeat to Jamaica. In the 2000 Asian Cup, Japan managed to reclaim their title after defeating Saudi Arabia in the final, becoming Asian Champions for the second time. Two years later, Japan co-hosted the 2002 World Cup with South Korea. After a 2–2 draw with Belgium in their opening match, the Japanese team advanced to the second round with a 1–0 win over Russia and a 2–0 victory against Tunisia. However, they subsequently exited the tournament during the round of 16, after losing 1–0 to eventual third-place finishers Turkey. On 8 June 2005, Japan qualified for the 2006 World Cup in Germany, its third consecutive World Cup, by beating North Korea 2–0 on neutral ground. However, Japan failed to advance to the Round of 16, losing to Australia 1–3, drawing Croatia 0–0 and losing to Brazil 1–4. During the 2010 World Cup qualification, in the fourth round of the Asian Qualifiers, Japan became the first team other than the host South Africa to qualify after defeating Uzbekistan 1–0 away. Japan was put in Group E along with the Netherlands, Denmark and Cameroon. Japan won its opening match of the 2010 World Cup 1–0 against Cameroon, but subsequently lost to the Netherlands 0–1 before defeating Denmark 3–1 to advance to the next round against Paraguay. In the first knockout round, Japan were eliminated from the competition following penalties after a 0–0 draw against Paraguay. After the World Cup, head coach Takeshi Okada resigned. He was replaced by former Juventus and Milan coach Alberto Zaccheroni. In his first few matches, Japan recorded victories over Guatemala (2–1) and Paraguay (1–0), as well as one of their best ever results, a 1–0 victory over Argentina. At the start of 2011, Japan participated in the 2011 AFC Asian Cup in Qatar. On 29 January, they beat Australia 1–0 in the final after extra time, their fourth Asian Cup triumph and allowing them to qualify for the 2013 FIFA Confederations Cup. Japan then started their road to 2014 World Cup in Brazil with numerous qualifiers. Throughout, they suffered only two losses to Uzbekistan and Jordan, and drawing against Australia. Afterwards, on 12 October, Japan earned a historic 1–0 victory over France, a team they had never before defeated. After a 1–1 draw with Australia they qualified for the 2014 World Cup, becoming the first nation (outside of Brazil, who hosted the tournament and qualified automatically) to qualify. Japan started their 2013 Confederations Cup campaign with a 3–0 loss to Brazil. They were then eliminated from the competition after losing to Italy 3–4 in a hard-fought match but received praise for their style of play in the match. They lost their final match 1–2 against Mexico and finished in fourth place in Group A. One month later, in the EAFF East Asian Cup, they started out with a 3–3 draw to China. They then beat Australia 3–2 and beat South Korea 2–1 in the third and final match in the 2013 EAFF East Asian Cup to claim the title. The road to Brazil looked bright as Japan managed a 2–2 draw with the Netherlands and a 2–3 victory over Belgium. This was followed by three straight wins against Cyprus, Costa Rica and Zambia. Japan was placed into Group C at the 2014 World Cup alongside the Ivory Coast, Greece and Colombia. They fell in their first match to Ivory Coast 2–1 despite initially taking the lead, allowing two goals in a two-minute span. They drew their second game to Greece 0–0. To qualify for the second round, they needed a victory against Colombia and needed Greece to beat Ivory Coast. Greece beat Ivory Coast 2–1, but Japan could not perform well against Colombia and were beaten 4–1, eliminating them from the World Cup. Alberto Zaccheroni resigned as head coach after the World Cup. In July 2014, former Mexico and Espanyol manager Javier Aguirre took over and Japan lost 0–2 to Uruguay in the first game he managed. Aguirre would begin a strong revamp of the team, switching out Zaccheroni's long-used 4–2–3–1 formation for his own 4–3–3 and applied this with a roster of the J.League's finest, dropping many regulars. A 2–2 draw against Venezuela was followed by a 1–0 victory over Jamaica. However, they lost their following match to Brazil 4–0, with Neymar scoring all four goals. Japan's sights turned to January and their title defense at the 2015 AFC Asian Cup. Japan won its opening match at the 2015 AFC Asian Cup in Group D against Asian Cup debutantes Palestine 4–0, with goals from Yasuhito Endō, Shinji Okazaki, Keisuke Honda via a penalty and Maya Yoshida. Okazaki was named man of the match. They then faced Iraq and Jordan in their next group matches, which they won 1–0 and 2–0 respectively. They qualified to knockout stage as Group D winner with nine points, seven goals scored and no goals conceded. In the quarter-finals, Japan lost to the United Arab Emirates in a penalty shootout after a 1–1 draw, as Honda and Shinji Kagawa missed their penalty kicks. Japan's elimination marked their worst performance in the tournament in 19 years. After the Asian Cup, Aguirre was sacked following allegations of corruption during a prior tenure. He was replaced by Vahid Halilhodžić in March 2015. Japan started on a rough note during qualification, losing to the UAE 1-2 at home. They then picked up the pace in their other qualifier games against Iraq, Australia, and Thailand, picking up 5 wins and 2 draws. Then, on 31 August 2017, Japan defeated Australia 2–0 at home thus qualifying them for the 2018 FIFA World Cup in Russia, making it their sixth successive World Cup. However, the Japan Football Association decided to sack Halilhodžić on 9 April 2018, only ten weeks before the World Cup finals, citing reasons of a breakdown in relationship between coach and player, and poor recent friendly results, and appoint the Technical Director, Japanese coach Akira Nishino, who had managed the Japanese Under-23 team at the 1996 Olympics, as the new manager. Japan made history in the 2018 FIFA World Cup by defeating Colombia 2–1, their first ever victory by any AFC team against a CONMEBOL team in an official tournament, as well as Japan's first ever victory at the FIFA World Cup finals in UEFA nations. Their second match ended in a draw against Senegal, with one goal scored by Takashi Inui and the other by Keisuke Honda. Japan were defeated in their last group game in the Group H against Poland 0–1, leaving Japan and Senegal tied for second with an identical record, however, as Japan had received two fewer yellow cards, Japan advanced to the knockout stage on the Fair Play Points tiebreaker, the first team to do so. The match with Poland caused controversy; as Japan were made aware of their advantage over Senegal with ten minutes left and decided to play an extremely conservative game, passing the ball around to one another and keeping it in their own box, seeking to avoid any bookings and didn't attempt to take any serious shots on goal, despite losing 0–1, with some fans booing the players. The match received comparison to the 1982 World Cup Disgrace of Gijón, in which a similar game was played. Japan were the only AFC team to have qualified to the knockout stage. In the Round of 16 against Belgium, Japan took a surprising 2–0 lead with a goal in the 48th minute by Genki Haraguchi and another in the 52nd by Takashi Inui, but yielded 3 goals afterwards, including the winner by Nacer Chadli on the counter attack in the 94th minute. This was Japan's third time having reached the last 16, equaling their best result at a World Cup. Japan's defeat to eventual third-place finishers Belgium was the first time a nation had lost a knockout match at the World Cup after taking a two-goal advantage since England lost to West Germany 2–3 in extra-time in the quarter-final of the 1970 edition. However, Japan's impressive performance was praised by fans, pundits and medias for their fighting spirits, as demonstrated by Japan's win over Colombia, a draw to Senegal and a strong counter offensive against heavyweight Belgium. Japan maintains a strong football rivalry with South Korea. Japan has played 78 matches against the South Korean football team with 14 victories, 22 draws, and 41 losses. The football rivalry is long-seated and is often seen as an extension of an overall historic rivalry between the two nations. Japan began to develop a fierce rivalry with fellow Asian powerhouse Australia, shortly after the latter joined the Asian Football Confederation (AFC). The rivalry is regarded as one of Asia's biggest football rivalries. The rivalry is a relatively recent one, born from a number of highly competitive matches between the two teams since Australia joined the AFC in 2006. The rivalry began at the 2006 World Cup where the two countries were grouped together, and continued with the two countries meeting regularly in various AFC competitions, such as the 2007 AFC Asian Cup, the 2011 AFC Asian Cup Final and the 2013 EAFF East Asian Cup. Japan also has a long standing rivalry with China, because of historical tensions between two countries in the past. China is leading the series with 16 wins, with Japan only has 14 wins; however Japan has achieved more successes than China. The Japanese team is commonly known by the fans and media as Sakkā Nippon Daihyō (サッカー日本代表), Nippon Daihyō (日本代表), or Daihyō (代表) as abbreviated expressions. Although the team does not have an official nickname as such, it is often known by the name of the manager. For example, under Takeshi Okada, the team was known as Okada Japan (岡田ジャパン, Okada Japan). Recently, the team has been known or nicknamed as the "Samurai Blue", while Japanese news media during the 2018 FIFA World Cup still referred it to by the recently departed manager's (Akira Nishino) last name, as "Nishino Japan" (西野ジャパン, Nishino Japan). Fans waving flags in support of the Japanese national team. Japanese national team supporters are known for chanting "Nippon Ole" (Nippon is the Japanese word for Japan) at home matches. The national team kit design has gone through several alterations in the past. In the early 1980s, the kit was white with blue trim. The kits worn for the 1992 Asian Cup consisted of white stripes (stylized to form a wing) with red diamonds. During Japan's first World Cup appearance in 1996 Asian Cup and in 1998, the national team kits were blue jerseys with red and white flame designs on the sleeves, and were designed by JFA (with the sponsor alternating each year between Asics, Puma, and Adidas). The 1996 design was reproduced in a special kit used against Syria on 7 June 2017. Japan uses blue and white rather than red and white due to a superstition. Japan used blue shirts in a 3–2 victory over Sweden in the first game of its maiden major international competition, the 1936 Summer Olympics. When Japan was coached by Kenzo Yokoyama (1988–1992) the kits were red and white, matching the colors of Japan's national flag. After failures at 1990 FIFA World Cup and 1992 Summer Olympics qualifications, the red shirt was scrapped. In the 2013 Confederations Cup and the 2015 AFC Asian Cup, Japan temporarily switched the colour of the numbers from white to gold. Japan's kit is provided by German company Adidas, the team's exclusive kit supplier since April 1999. Before that, Asics and Puma had been the team's official apparel sponsor alongside Adidas. The crest or emblem of the national team was adopted in late 2017 as part of a larger rebranding by the Japan Football Association. The crest features the Yatagarasu, a three-legged crow from Japanese mythology , holding a solid red football. 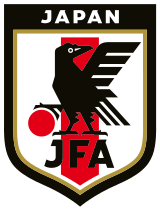 The text "JFA" (for the Japan Football Association) is inscribed at the bottom of the crow. A red stripe is also present at the center of the shield behind the crow. The shield has a metallic gold trim and has a thicker black outline. The name of the country represented by the national team "Japan" is also inscribed within the black border. The previous crest had a shield with a more complex shape. The ball held by the Yatagarasu had white details. The text "Japan" is absent and "JFA" is written in a different typeface. Japan has one of the highest sponsorship incomes for a national squad. In 2006 their sponsorship income amounted to over 16.5 million pounds. Primary sponsors include Adidas, Kirin, Saison Card International, FamilyMart, JAL, MS&AD Insurance Group, Asahi Shinbun, Mizuho Financial, Daito Trust Construction and KDDI. The mascots are "Karappe" (カラッペ) and "Karara" (カララ), two Yatagarasu wearing the Japan national football team uniform. The mascots were designed by Japanese manga artist Susumu Matsushita. Each year when a new kit is launched, the mascots change uniforms. For the 2014 FIFA World Cup, the Pokémon character Pikachu served as the mascot. The following players have been called up for the 2019 Kirin Challenge Cup matches against Colombia and Bolivia. Caps and goals as of 26 March 2019 after the match against Bolivia. The following players have been called up to the Japan squad in last 12 months. INJ Withdrew due to an injury. RET Retired from national team. Statistics below are from matches which the Japan Football Association consider as official. *Denotes draws includes knockout matches decided on penalty shootouts. Red border indicates that the tournament was hosted on home soil. Gold, silver, bronze backgrounds indicate 1st, 2nd and 3rd finishes respectively. Bold text indicates best finish in tournament. Since 1992, the Olympic team has been drawn from a squad with a maximum of three players over 23 years age, and the achievements of this team are not generally regarded as part of the national team's records, nor are the statistics credited to the players' international records. Japan is the first team from outside the Americas to participate in the Copa América, having been invited in both 1999 and 2011. However, Japan declined their invitation on 16 May 2011, after events related to the difficulty of releasing some Japanese players from European teams to play as replacements. On 17 May 2011, CONMEBOL invited Costa Rica to replace Japan in the competition; the Costa Rican Football Federation accepted their invitation later that day. On 16 August 2013, CONMEBOL president Eugenio Figueredo announced that Japan was invited to the 2015 Copa América. However, Japan later declined the invitation due to scheduling problems. On 14 May 2018, CONMEBOL announced that Japan, alongside Qatar, will be the two invited teams for the 2019 Copa América. Football at the Asian Games has been an under-23 tournament since 2002. As of 26 March 2019. ^ "Japan National Football Team Results: 1910–1919". Football Japan. p. 29 December 2012. Retrieved 17 July 2014. ^ "1917年の日本サッカー ｜ 日本サッカーアーカイブ". 日本サッカーアーカイブ (in Japanese). Retrieved 19 June 2018. ^ a b c "Japan Football Museum| Japan Football Association". www.jfa.jp (in Japanese). Retrieved 19 June 2018. ^ "World Cup 1938 Qualifying". www.rsssf.com. Retrieved 19 June 2018. ^ a b "World Football Elo Ratings". www.eloratings.net. Retrieved 19 June 2018. ^ a b "Origins and History｜JFA｜Japan Football Association". www.jfa.jp (in Japanese). Retrieved 19 June 2018. ^ Matsushima, Ken. "History of the J. League". Rising Sun News. Archived from the original on 12 May 2006. Retrieved 2 November 2016. ^ Hongo, Jun (9 February 2010). "Japan team has foot in World Cup door but can it kick?". Japan Times. p. 3. Archived from the original on 12 June 2018. Retrieved 29 June 2018. ^ Staff and agencies (29 January 2011). "Australia 0 Japan 1 (aet): match report". The Daily Telegraph. Telegraph Media Group Limited. Retrieved 2 February 2011. ^ "Japan coach gamble to pay off?". Pete Hall. Sky Sports. 19 June 2018. Retrieved 1 July 2018. ^ "Japan make history with World Cup win against 10-man Colombia". Agence France Presse. 19 June 2018. Retrieved 25 June 2018. ^ Gendler, Daniel (24 June 2018). "Japan and Senegal Control World Cup Fates After Draw". New York Times. The New York Times Company. Retrieved 25 June 2018. ^ Mather, Victor (27 June 2018). "Japan Advances in World Cup 2018 Despite Losing to Poland". New York Times. The New York Times Company. Retrieved 28 June 2018. ^ Tweedale, Alistair; Ducker, James (28 June 2018). "Lucky Japan qualify for knockout stages through Fifa's fair play rules despite losing 1-0 to Poland". The Daily Telegraph. Telegraph Media Group Limited. Retrieved 28 June 2018. ^ "World Cup's most shameful moment". NewsComAu. Retrieved 6 July 2018. ^ "World Cup 2018: Japan go through but final group game ends in 'mind-boggling farce'". BBC Sport. 28 June 2018. Retrieved 6 July 2018. ^ Glendenning, Barry (28 June 2018). "Japan 0-1 Poland: World Cup 2018 – as it happened". The Guardian. ISSN 0261-3077. Retrieved 6 July 2018. ^ "'Anti-football': World Cup fair play farce embarrasses Japanese fans". South China Morning Post. Retrieved 6 July 2018. ^ FIFA.com. "2018 FIFA World Cup Russia™ - FIFA.com". www.fifa.com. Retrieved 6 July 2018. ^ "World Cup 2018: Belgium stun Japan to reach quarters". BBC Sport. 2 July 2018. Retrieved 2 July 2018. ^ "A two-goal comeback after 48 years, and a new high for AFC". Debayan Sen. ESPN. 2 July 2018. Retrieved 3 July 2018. ^ "England finish fourth at World Cup after Eden Hazard seals Belgium win". Dominic Fifield. The Guardian. 14 July 2018. Retrieved 14 July 2018. ^ "Australia, Japan rivalry hits new heights". Football Federation Australia. Retrieved 30 September 2013. ^ "Highlights". Foxtel.com.au. Archived from the original on 16 November 2014. Retrieved 3 May 2015. ^ Sebastian Hassett. "Socceroos to resume Japan rivalry in qualifying group for Brazil". Smh.com.au. Retrieved 3 May 2015. ^ "Japan-Australia: a classic football rivalry". theroar.com.au. Retrieved 30 September 2013. ^ ハリルジャパン、白星発進!!岡崎&本田のゴールで初陣飾る. Gekisaka (in Japanese). Kodansha. 27 March 2015. Retrieved 9 April 2015. ^ 岡崎、本田がゴール！　ハリルジャパン初陣を勝利で飾る. Football Channel (in Japanese). Kanzen ltd. 27 March 2015. Retrieved 9 April 2015. ^ "Why does Japan wear blue soccer uniforms?". The Wichita Eagle. ^ "JFA renews visual identity and reconstructs brand values". Japan Football Association. 1 November 2017. Retrieved 27 July 2018. ^ a b "NEW JAPANESE NATIONAL TEAM LOGO UNVEILED". Soccer 365. 1 November 2017. Retrieved 27 July 2018. ^ D'Asaro, Filippo. "The new Japan's National Team Logo". NSS Magazine. Retrieved 27 July 2018. ^ Sanchez, Miranda (15 March 2014). "Pikachu Named Mascot of the 2014 World Cup". ^ Yoon Hyung-Jin. "Japan International Match – List of Full International Matches". RSSSF. Retrieved 1 July 2012. ^ Mamrud, Roberto. "Japan – Record International Players". RSSSF. Retrieved 2 July 2012. ^ "Players Records". Japan National Football Team Database. Retrieved 15 May 2014. ^ "Managers". Japan National Football Team Database. Archived from the original on 17 May 2014. Retrieved 15 May 2014. ^ "El Presidente Figueredo Aguerre anunció la presencia del Japón en la Copa América Chile 2015" [President Figueredo Aguerre announced the presence of Japan at the 2015 Copa América in Chile] (in Spanish). CONMEBOL. 16 August 2013. Retrieved 1 July 2018. I want to announce that the Japan national team will participate at the 2015 Copa América. ^ Sánchez Sandoval, Édgar (2 June 2016). "Copa América: Japón, el invitado más extraño" [Copa América: Japan, the most strange invitee] (in Spanish). Publimetro Chile. Retrieved 1 July 2018. Even in 2015, the japanese were asked to be part of the Copa América in Chile, but they withdrew again due to problems with their calendar and previously scheduled matches. ^ González, Christian (4 May 2018). "Conmebol confirma a Japón y Qatar en la Copa América de 2019" (in Spanish). La Tercera. Retrieved 1 July 2018. CONMEBOL confirmed, via its website, what has been speculated several months ago: Japan and Qatar will be invited at the event that will be held in Brazil. ^ "Team Records". Japan National Football Team Database. Retrieved 15 May 2014.